The opening part of the album is quite thrashy. Both the title track and “We Are the Lamb” are heavy stuff, the latter even being death metal. They have surely left the nu-metal they are marketed as. They start making an impression with “Whisper of Death”. The growls that pester quite a lot of the album are on the shrill side, though not blackish. “Whisper of Death” represents the right mix, alongside “Never Come Home” and my favorite “Time Never Heals”. 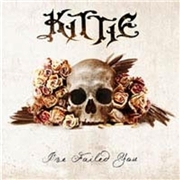 I prefer when KITTIE surprise me, which is when they use more clean vocals than grow, and when they are not as easily labeled. The thrash/death beginning and their attempts to sound really bad, “Empires (Part II)”, “Come Undone” are best forgotten. The maturity of “Time Never Heals” and the well-oiled nu-metal of the powerballad-ish “Never Come Home” hint at a new beginning for the band. The album is quite layered, with at least three stages shown. This makes the album as a whole a quite disparate affair. I wonder who will like it as a whole? I know what I prefer and I know that is only one third, but it is promising third, saving their day to some extent.